I'm author of the forthcoming Book Collecting Now: The Value of Print in a Digital Age. As an editor and freelance writer, I've spent my life immersed in words, and it's great to have a place to put many of them. Here are most of my post-college bylined articles, organized loosely by category, including a section with entire issues of The Conference Board Review, which I edited for six years. Author interviews, essays on books, books I've written or contributed to, and more. Forthcoming May 1, 2019, from Chatwin Books! I wrote this illustrated introduction to book collecting for House of Collectibles' "Instant Expert" series; it ended up selling nearly ten thousand copies. On May 1, 2019, Chatwin Books will publish the follow-up, titled "Book Collecting Now." "Fourteen books?" my wife asks in a harsh whisper. "Haven't we seen Carl Hiaasen, like, three times?" Four times, I think. ''I'm, uh, not sure how I ended up with so many books." "So how many do you already have signed?" Maybe thirty. "This'll be our last Hiaasen reading for a while—I promise." She looks down, shakes her head, and opens the canvas bag I've handed her. "So what did you give me to bring up?" Review of Kathleen Day's "S&L Hell: The People and the Politics Behind the $1 Trillion Savings and Loan Scandal, L. William Seidman's "Full Faith and Credit: The Greal S&L Debacle and Other Washington Sagas," and Michael Binstein and Charles Bowden's "Trust Me: Charles Keating and the Missing Billions." Grinning shyly, Michael Chabon was genuinely surprised to get a warm reaction from a packed room at Black Oak Books early last month. "I guess I just figure there's no reason why I should expect to get a good turnout or expect people to buy my books," he said later in an interview. Long after the echoes of fireworks fade, reverberations from another July 4 event will continue unabated. This Independence Day also marked the 50th anniversary of history's most famous UFO event; tens of thousands made pilgrimages to beleaguered Roswell, N.M., the site of the notorious 1947 weather balloon—sorry, flying saucer—crash. An original essay published in this massive Perseus/Bloomsbury business encyclopedia; a revised version was published in the book’s 2006 second edition. At 28, Marcus Mabry has made good. Raised in poverty in Trenton, he's held the prestigious position, of Paris correspondent at Newsweek for two and a half years, and last month a major pubIisher shipped his provocative memoir, "White Bucks and Black-Eyed Peas," to bookstores. Along with editing and writing books, I sell a few. Check out my online store, with around two thousand titles, on the AbeBooks website. Profile of Yossi Melman, author of "Every Spy a Prince: The Complete History of Israel's Intelligence Community." Returning a call from his Seattle home, short, paunchy novelist Mark Helprin impersonates a deep-voiced black man from Oakland, insisting that the Jewish Bulletin reporter had smashed up his car, and demanding restitution. He maintains the threatening persona for 10 minutes before revealing his real identity. "You're young," he chuckles. "You'll get over it." Jewishness helps writer understand life's "underdogs"
Profile of New York Times columnist Anthony Lewis, author of "Make No Law." A dozen pages into any Anne Lamott book, you desperately want to be her best friend. Once you've read pieces, you'll want to not only meet her but take her to lunch. Her nonfiction work, including biweekly drop-dead funny journal entries in the online magazine Salon, is nakedly personal; it's no wonder readers feel as though they know her and her son Sam intimately. On his way to debate David Duke on a Canadian talk show just before last week's Louisiana election, Alan Dershowitz expressed disgust over the right-wing politician's vote-getting success. "In some respects, this marks the end of the statute of limitations on the Holocaust," Dershowitz said. "It has now become permissible to vote for a Nazi." On the telephone, Chaim Potok sounds something like David Lurie, the protagonist of Potok's "In the Beginning"—cryptic and a bit brusque and humorless. But the man who has brought Orthodox Judaism alive for millions turns animated when discussing reactions to his books. "I thought when I wrote The Chosen that it was just a Jewish story. It turns out to be a pretty universal story," Potok says of his first and best-known novel, which describes a young Orthodox man caught between his culture and his intellectual pursuits. As you might expect, there are no ashtrays in Richard Kluger's house. Well, maybe a few. "That's sort of an ashtray"—he points to a flowered ceramic dish on an end table—"but almost no one we know smokes anymore," he says. "But if they want to, we do let people smoke in here." Some morning soon, Stephen Frey will, as he does every weekday morning, hop the train at Princeton Junction, take his seat amongst the hundreds of other commuters making their way to Manhattan and find himself next to someone engrossed in a thick gold-and-black book with a familiar mugshot on the dustjacket. His. Profile of Ruth Gruber, author of "Ahead of Time: My Early Years as a Foreign Correspondent." 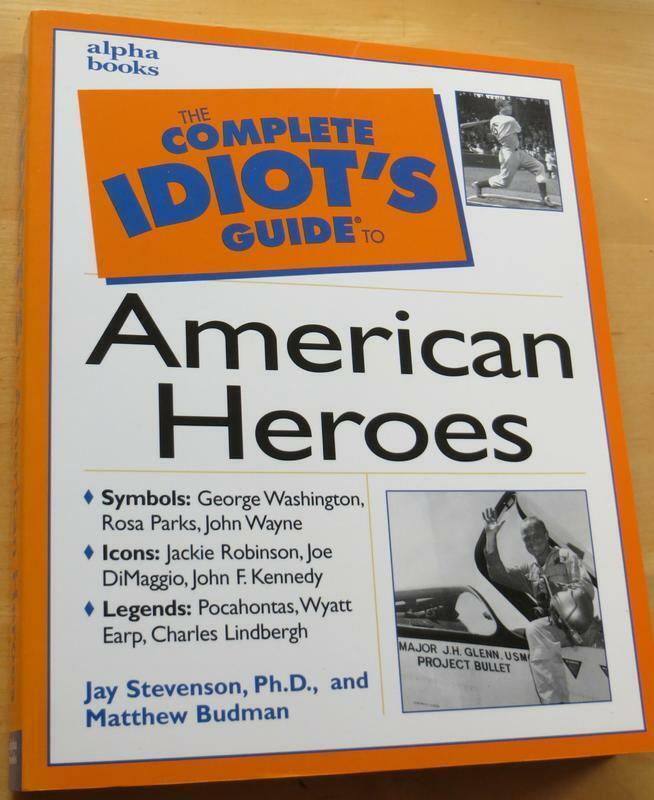 My friend Jay Stevenson, author of a dozen or so entries in the "Complete Idiot's Guide" series, asked me to co-write this one. I handled the chapters on sports and music. More than a little embarrassing to acknowledge, but here it is anyway. As an adolescent, my reading tastes ran more to sci-fi than management and strategy, and my speculations about the year 2000 resembled something out of The Jetsons. It's comforting, I suppose, to discover that I was far from alone, and that many of those who foresaw populated moonbases and cruise-around-town jetpacks didn't have the excuse of youth.